The Cooling Cubes by Golden Juice guarantee ice-cold promotions. 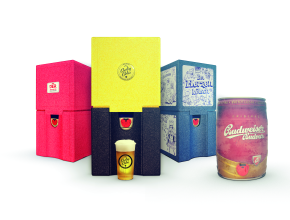 Whether for a picnic or barbecue party, at open-air festivals or while watching a football match with friends – the cooling device made of high-quality, insulating EPP (expanded polypropylene) keeps beer and other drinks in five-litre barrels cold for 24 hours thanks to the up to three integrated cool packs, when there is no fridge around. A literally cool idea, that was rewarded with a Promotional Gift Award in the category Communicative Products. Particularly practical: The Cooling Cubes have an integrated tapping table and can also be used as a seat. A carrying handle and matching beakers are also available as further accessories. Manifold customising options round off the professional appearance. For example, eight surfaces can be individually imprinted or decorated with labels, whereby a discrete, high-quality branding is also possible in the form of a doming sticker. The Cooling Cubes come in a choice of ten colours, which can be combined with each other.